A lot of these posts just show the arrogance of many Grand Caymanians. As a Braca, I don’t see the practicality of a cruise ship dock on the Brac. I dohowever think that the ferry idea will be more practice. There are hardly any tourists visiting the Brac. The economy is at a standstill, and something needs to be done. What the people of the Brac need to do is ask their Premier some serious questions and demand serious realistic answers, and not be fooled by round-about parables. Ask her what is the economic plan for the Brac, beyond reduced Government fees. It takes more than that to help the Brac economically. The fact is, she doesn't have a clue, and will instead spin manure. If Cayman Brac people are serious about changing the situation of the Brac, they have to get serious about changing the representation as well. Until then, nothing will change. She living good, you all suffering. What we should do is provide some sort of day or multi day ferry service between Grand Cayman and Cayman Brac. They do it in Florida between Ft. Lauderdale and The Bahamas and its quite enjoyable, they make it buffet/brunch/all you can drink kind of ferry and it is always packed. Have set departure times fromGrand Cayman and Cayman Brac daily and allow people the freedom to go back and forth between the islands in a unique way. You could even provide the option to have flexible tickets (for example, once you buy a return ticket, you can leave either island at any departure time within a three day period). Sure, its a whole day trip, but tourists enjoy that; and it gives us an opportunity to stimulate tourism in our sister islands as well. have you ever been to cayman brac???? Yeah I have, and I probably wouldn't go again – but let the tourists figure that out on their own! As the original poster who suggested the ferry idea – yes, I have indeed been to Cayman Brac multiple times. There are gorgeous beaches and wonderful dive sites full of fantastic aquatic life. I love the easier way of life there and I think that the island needs a positive injection of both people and economical boosters. I think we should be encouraging tourism on our sister islands, not hinting that people should shy away from them. Every island has a different feel, a different way of life and different experiences, and they are allbeautiful and worthwhile. Cayman proud! I'd do a day trip cruise to Cayman Brac for sure. If they also offered some kind of diving trip/snorkeling adventure/environmentally interesting activity then all the better. It must be nice to laugh at other people's woes. Cayman Brac needs something like that right now to put a little cash in the economy. The economy is stagnant in Cayman Brac. 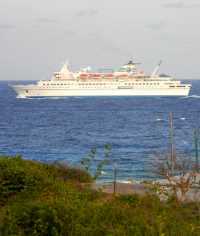 Cayman Brac did have a cruise ship come 5 years ago but unfortunately this time of yearthe weather is rough. The ironic part is if they had come tomorrow, the weather would have been better but "not every disappointment in life is a failure" and Brackers always land on their feet. No disrespect for the Brac, but because of how the island is set out there it would hve to be a calm day for the embarking and disembarking of cruise passengers in the Brac. h government is spending in excess of $3million per year to cause the Brac to be recognized as an international port. This is a total waste of the peoples money. But as long as you have fools wasting the money you will have fools buying the idea that an international port is necessary. This is a good example of why that port should be down graded to a local landing only. SAVE OUR MONEY, POLITICIANS. Absolute waste of government funds. The amount of time and effort put into this is ridiculous you would have thought that we were having a Royal visit. Why is the government even funding this type of visit by a private vessel. Furthermore, it was obvious from last week that the weather was going to be bad and that they would be unable to come ashore. The powers that be just have to admit defeat and that Cayman Brac is not the place for cruise ships and therefore stop wasting time and money. I wonder if Julianna will also say that this due to an act of God? Would that mean that it is because of God that the cruise ship did not dock in port? The Brackers will be wanting a cruise ship dock next. "Well if Grand Cayman is getting one, the Brac should get one too . . . "
Ya get what you wote for!! So did you. At least Brackers can say, they don't have a choice. What is Cayman's excuse for Elio, McKeeva, Rolston, Eugene, Jon Jon, etc? Why not? The Brac's nonexistant finger piers are everybit as evident as our own. That will be in Julianna's next budget. BTW, how's the Hurricane Hilton coming along?